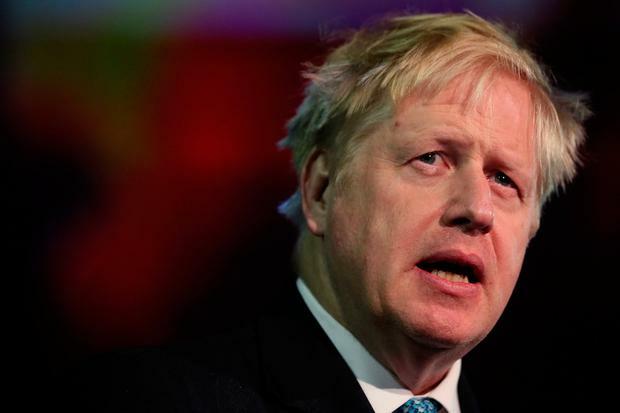 Former foreign secretary Boris Johnson has called on Theresa May to postpone another vote on her Brexit deal, warning it would be "absurd" to bring it back to the Commons without first securing change from Brussels. It was not possible that "anybody who believes in Brexit" could back the Prime Minister's deal in a so-called "meaningful vote 3" unless the proposed backstop arrangements for the Irish border are revised, he said. But Mrs May received a boost from former chancellor Lord Lamont, who urged fellow Brexiteers to focus on the "prize" of leaving the EU and back her deal. Downing Street was scrambling for support for the deal - particularly from the Democratic Unionist Party - in the hope of bringing it back before Parliament ahead of an EU summit on Thursday. "'No deal' will prove to be the precursor to a very good deal indeed," wrote the Tory MPs, including former ministers Owen Paterson, Sir John Redwood and David Jones. "Our moral course is clear: it is not our fault that we are confronted by two unacceptable choices, but it will be our fault if we cast a positive vote in favour of either for fear of the other." Mr Johnson said Mrs May's Agreement would leave the UK "in a position of almost unbearable weakness" for subsequent talks on trade, risking transforming the country into "a kind of economic colony of Brussels". The backstop arrangement - under which the UK remains in a customs union until both sides agree a trade deal - gives the EU "an indefinite means of blackmail", said the Brexit figurehead. "Unless we have some change - and at present, in the immortal phrase, nothing has changed - it is hard to ask anyone who believes in Brexit to change their mind," he said. "There is an EU summit this week. It is not too late to get real change to the backstop. It would be absurd to hold the vote before that has even been attempted." But Lord Lamont warned that if the Prime Minister's deal falls, Brexit may never happen. Writing in the Daily Mail, he said that "history will not understand if it is Conservative MPs who prevent us claiming our self-government". DUP MLA Jim Wells told BBC Radio 4's Today programme: "We still have a huge difficulty with the backstop, because we see it as a waiting room for constitutional change. Mr Wells said a proposed "gentlemen's agreement" that any changes to Northern Ireland's relationship with the EU would be mirrored by the rest of the UK might prove "unenforceable". And he denied that the DUP was taking part in a financial "auction" for its support, insisting that "money is not being discussed on the table at the moment". Mr Wells estimated that as many as 30 Tory MPs will never vote for Mrs May's deal, meaning that a third defeat was "inevitable" with or without DUP support. Bolton West MP Chris Green told BBC Radio 4's Westminster Hour: "I want to vote against it because I don't believe when Parliament defeated it by the biggest margin in the history of Parliament that was because it was in any way a good deal, and the substance of the deal hasn't changed." But he added that a shift in the DUP's position would have a "big impact" and the implications of rejecting the deal for a third time weighed heavily on him "because it could lead to a general election, and we don't know how that will pan out". And Security Minister Ben Wallace, a close ally of Mr Johnson who chaired his abortive bid for the leadership in 2016, urged the former foreign secretary and other Tory Brexiteers to back Mrs May's deal. "I know Boris very well and I know he's passionate about leaving the European Union," Mr Wallace told BBC Radio 4's Today programme. "If he is passionate about that, he will recognise that voting for this deal is the way to deliver Brexit and the way to deliver leaving the EU ... I strongly urge my colleagues to vote for it." Labour leader Jeremy Corbyn was holding a series of meetings with other Westminster leaders including the SNP's Ian Blackford and Liberal Democrat Sir Vince Cable and influential backbenchers in an effort to find a consensus on a rival Brexit strategy.